Posted on May 12, 2015 by Lydia / This entry was posted in New Products and tagged brooklyn, head shop, Herbal Vape, Launch Box, Magic Flight, NYC, Smoke Shop NYC, vape, Vape Smart. Bookmark the permalink. 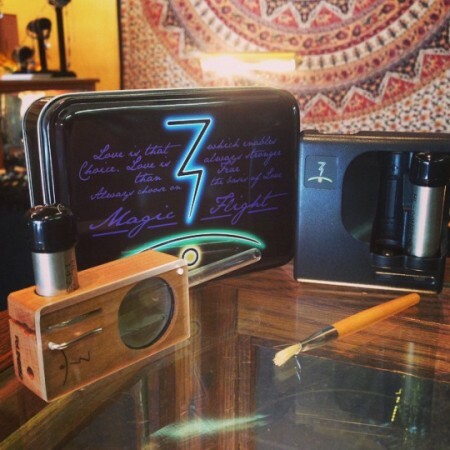 We are very pleased to once again carry the Magic Flight Launch Box here at Sunflower Glass! This herbal vaporizer is one of the most tried and true models available today. Simply insert the battery and hold it down to produce vapor from the trench in 3-5 seconds. Each battery can vaporize 2.4 trenches of finely ground herbs per charge. This vape is a healthy alternative to smoking with zero combustion to help you breathe easy and optimize the use of your herbs making them last up to four times longer. Comes with two batteries, a battery charger, a glass mouth piece, cleaning brush, and a storage tin. These went fast last time we had them so stop by today and grab the perfect tool for your summer adventures!